Carla went to her parent's for the weekend, so I was on my own for Friday's dinner. That's usually when I stop by the seafood dept to see what's come in for the weekend. A happy surprise was soft-shelled crabs! A perfect single-serving indulgence of crispy crustacean. I like Wegman's seafood dept because they always keep the soft-shelled crabs alive until the moment you order one, unlike some stores that clean a whole tray at once and leave them faceless, dead, and rapidly decomposing. 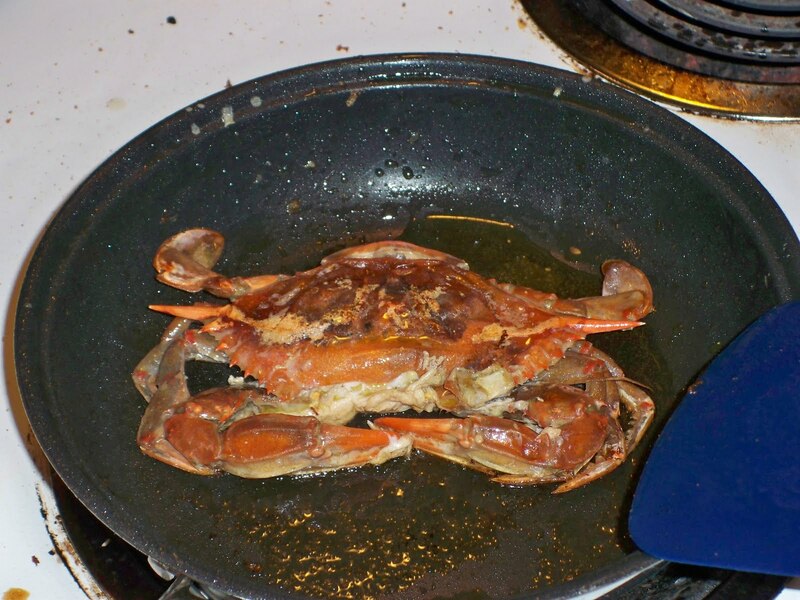 That day, however, the clerk forgot to clean the crab so I came home with a live bugger, little to my knowledge. 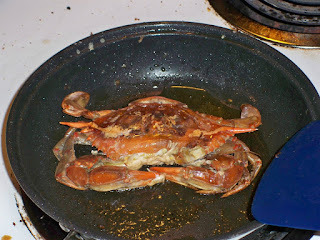 I did pretty well cleaning him, but I must have ruptured something (in the crab, not me). As soon as he hit the hot saute pan, a thin, clear liquid came out, immediately turning a milky white and solidifying. 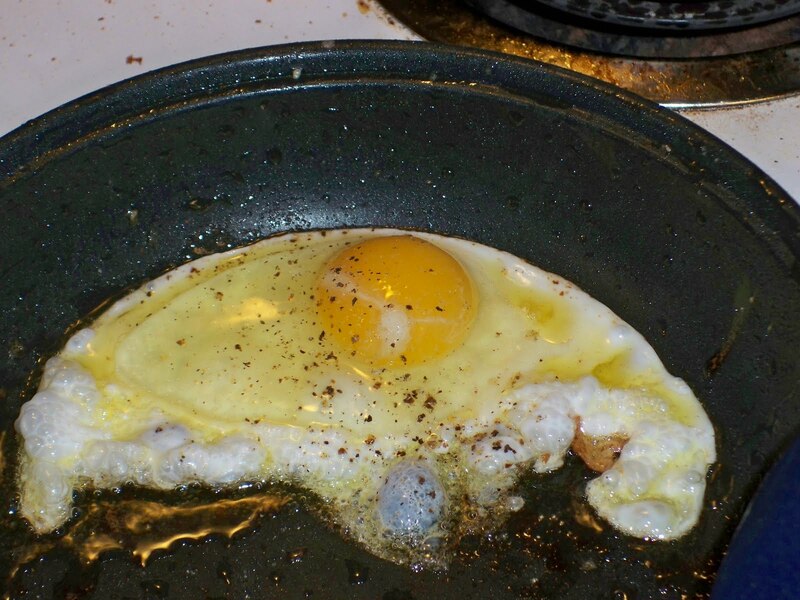 It reminded me of an egg's first moments in a hot skillet. The white quivers from clear liquid to opaque jelly to firm ivory in a matter of seconds. Then I got hungry for an fried egg. Fried eggs make everything taste better. Fried eggs complete bacon. Fried eggs turn toast into dipping sticks. Fried eggs make a steak delicious, with a rare yolk pouring out over the top. And a fried egg makes a croque monsieur into a croque madame! So my plans of a crispy soft-shelled crab on a focaccia roll became exponentially more extravagant. Normally a croque monsieur is a grilled sandwich of Gruyere and jambon de Bayonne ham. The addition of an egg turns that monsieur into a madame. I was swiping out the ham for a crab, but still needed cheese. With no Gruyere in the house, I did find a small wheel of Brugge Jeune, a mild, creamy cheese from Belgium similar to gouda. 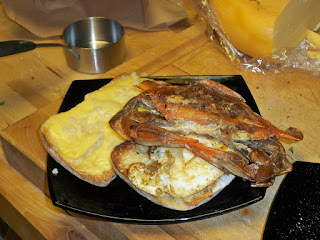 To play off the sea food I was incorporating, I rubbed some prepared horseradish into the cheese, then popped it into the toaster oven. Although I didn't plan it, this sandwich was pretty tasty. Overcomplicated? Sure, but it's fun for me to make the occasional Dagwood-esque monstrosity. Also. it worked in my favor to use such a mild cheese. The cheese and egg blended together to taste like a rich sauce spiked with horseradish, complimenting the crispy, sweet-briny flavor of the crab. Something like cheddar would have overwhelmed the crab, as was the dill pesto I momentarily considered. And who cares about a crab sandwich if all you taste is the condiments?